Everywhere you go around Austin, you are sure to see someone out with their dog. Whether on a trail, in a coffee shop, or having happy hour, dogs are keeping Austin furry. In honor of National Dog Day, August 26, we put together a list of some of the top places to take your four-legged best friend in and around the city. Located in a renovated historic home on East Cesar Chavez, Cenote serves coffee, wine, beer, and a menu filled with local purveyors. The patio is dog-friendly and water bowls are provided. 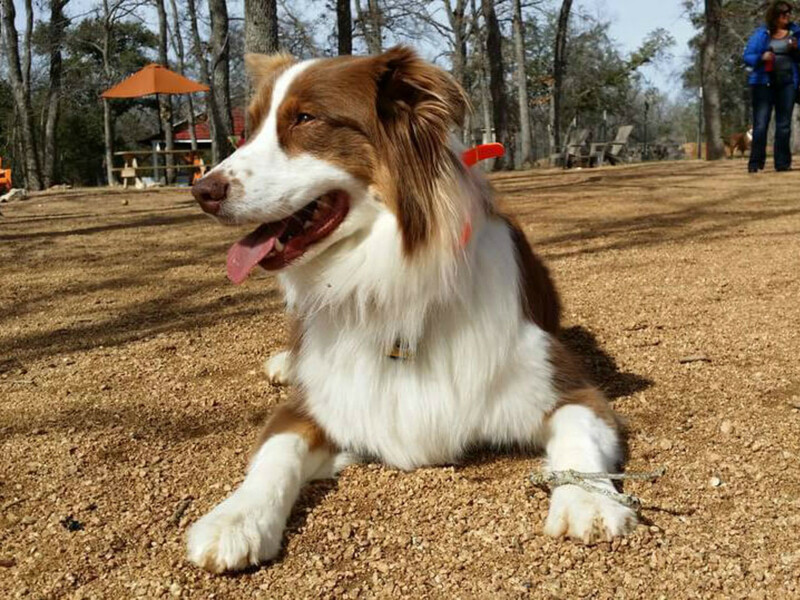 Located in Leander, this dog park is as much fun for humans as it is for dogs. Come for a casual gathering or join them on September 11 for the Who Adopted Who event benefiting the Williamson County Regional Animal Shelter. This 40-room urban bungalow style hotel is located on South Congress and welcomes dogs on the lounge patio, as well as in the guest rooms. Dogs are very much loved here and always treated with a water bowl and plenty of dog treats. Get slightly out of town and head west on Highway 71 to Jester King Brewery, a farmhouse brewery specializing in wild ales and spontaneously fermented beers. Leashed dog are allowed to hang out with you while you sip beers crafted from the brewery's own well water and locally grown malted grains. Home to the iconic “I love you so much” wall on South Congress, Jo’s coffee shop loves dogs. Grab a coffee and pastry for you as well as some dog treats for your best friend. And don't miss the Lyndon Lambert Memorial & Pet Parade Contest held every year in March, where dogs parade down South Congress in full costume — a sight to behold. 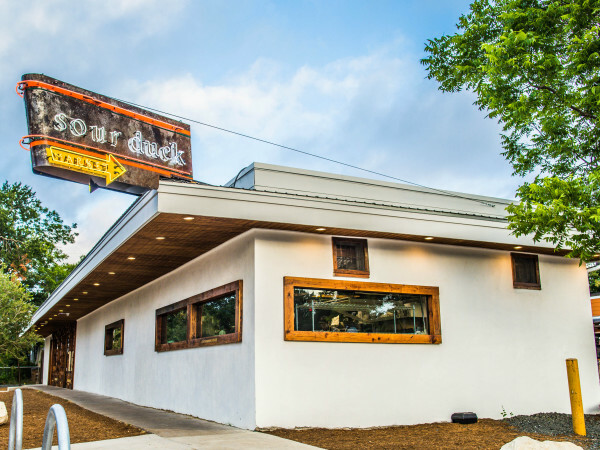 Located in “Way South Awesome, Texas,” Moontower Saloon welcomes dogs inside the bar and outside on the enormous wooded patio area. Dogs must be on leash, but there is plenty of room for them to stretch out and walk around. Providing a European atmosphere on the lake, this coffee shop offers an assortment of hot and cold beverages, pastries, and cheesecakes. Wi-Fi is complimentary and dogs are welcome on the beautiful patio with water bowls provided. Nestled under the shade of beautiful oak trees, Perla’s patio is perfect for dogs and people watching. Serving lunch, dinner, and weekend brunch, the menu offers an array of fresh seafood, and water bowls are provided for dogs. Recreate the famous scene in Lady and the Tramp on the patio at Taverna, where you can order plain noodles for your dog. Water bowls are provided for your dog at this little piece of Italy on Second Street. A dog park and bar in one spot. Dogs can enjoy room to play and gourmet eats off the doggie menu, including sliders and ice cream. No need to be jealous — there is plenty of fun and a wide assortment of food and drinks for humans as well. Daily admission is $5 per dog with annual and monthly memberships available. Red Bud Isle: This popular leash-free park for dogs offers trails and swimming. But get there early as parking is limited. 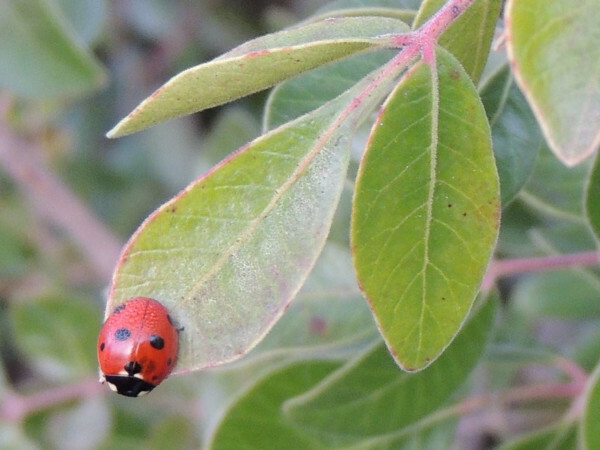 Turkey Creek Trail at Emma Long Metropolitan Park: Enjoy the Turkey Creek nature trail at Emma Long located in northwest Austin. Having so much fun you want to stay all night? Camping is available. Zilker Park: The City of Austin operates 12 off-leash dog areas in the city. 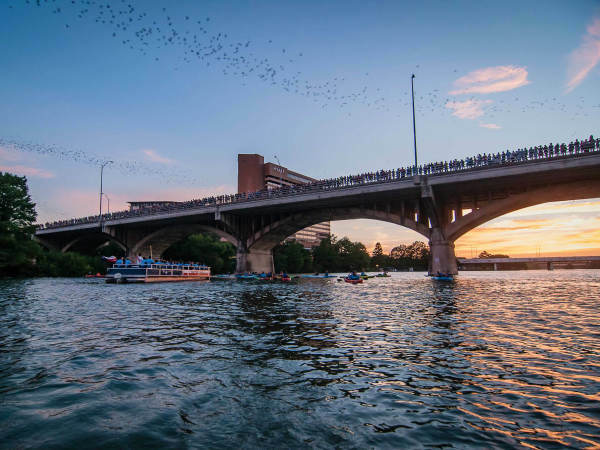 One of the most popular areas is Zilker Park, with its unfenced grass oasis and amazing views of the city.